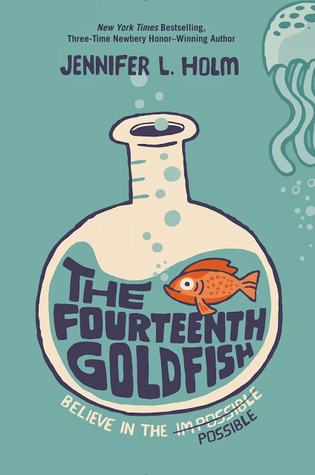 The Fourteenth Goldfish by Jennifer L. Holm was a nominee for the 2016-17 South Carolina Children’s Book Award. Things were so much simpler for Ellie in elementary school. She didn’t have to worry about where to sit in the cafeteria, losing her best friend, or all the other changes middle school brings. Well, soon Ellie will have one more change…and this one will rock her entire world. One day, Ellie’s mom brings home a strange yet oddly familiar boy. He bears a striking resemblance to her grandfather, but Ellie doesn’t know of any long-lost relatives who would just show up all of a sudden. So who is this odd, crotchety, young boy? Well, as it turns out, this boy actually is Ellie’s grandfather, Melvin. Through his research with jellyfish, he seems to have found the “cure” for aging, and this seventy-six year old man now looks like a teenager. (He still acts like an old man, though.) Melvin shares his discovery with Ellie and enlists her help in retrieving the research that he’s sure will win him a Nobel Prize. Ellie is intrigued by her grandfather’s work, but, the more she learns about science and what happens after important discoveries–like Oppenheimer’s work on the atomic bomb–the more she wonders if Melvin’s breakthrough is a good thing. Does the world really need a cure for aging? What would be the consequences if such a thing were available?